ATLAS is a huge and highly complex particle physics detector built by an international collaboration of over three thousand scientists, including over a hundred from Canada! 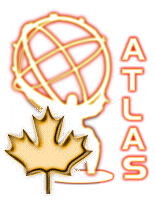 Canadian groups have designed and built large parts of ATLAS. ATLAS weighs about seven thousand tons and completely fills a 46 by 25 by 25 metre cavern situated 100 metres underground, in the 27-kilometre circular tunnel of CERN's Large Hadron Collider (LHC) located on the French/Swiss border near Geneva. Bunches of protons in two counter-circulating beams are accelerated to energies of 13 trillion electron-volts (13 TeV), and these bunches collide with each other in the heart of the detectors, 40 million times every second. The unprecedented rate and energy of the proton collisions in the LHC allow us to explore the structure of matter and the fundamental forces, as well as search for new elementary particles. These high-energy proton collisions are able to reproduce the conditions of the early universe less than a billionth of a second after the Big Bang providing, for a brief instant, the energy needed to create new forms of matter. In July 2012, the ATLAS Collaboration announced the discovery of a new type of matter consistent with the long-sought-after Higgs boson, a fundamental particle whose existence would elucidate how matter acquires mass. Though Canada is not a CERN member state, Canadians have significantly contributed to the LHC in the form of in-kind contributions to the LHC accelerator and its injector complex, worth over 40M$CDN. These contributions were made through TRIUMF and included substantial contracts with Canadian industry.